Capuchin monkeys are tree-dwelling New World monkeys that live in central and southern America. These intelligent and clever monkeys use tools such as stones to crack open nuts, shellfish and crabs. Their abillity to be easily trained gave rise to their exploitation as organ grinder monkeys. They were named by explorers after their resemblance to an order of Catholic friars, the Order of Friars Minor Capuchin. Where do Capuchin Monkey's live? Capuchin Monkeys live in low-lying forests, in primary or advanced rainforests. They are native to Southern Central America. They are found from Costa Rica to Paraguay and Trinidad. These animals have adapted to living in places populated by man. Capuchin Monkeys are tree-dwellers. What does a Capuchin Monkey look like? Capuchins generally resemble the friars of their namesake. Their body, arms, legs, and tail are all darkly (black or brown) colored, while the face, throat, and chest are white colored, and their heads have a black cap. The long hairy tail is partly prehensile. It serves as an anchor or prop when Capuchin Monkeys travel through the trees. Capuchin Monkeys reach a length of 30 to 56 centimetres (12 - 22 inches), with tails that are just as long as their body. Capuchin Monkeys weigh up to 1.3 kilograms (2 - 3 pounds), with brains of mass 35 - 40 grams. They are considered the most intelligent New World monkeys. What does a Capuchin Monkey eat? Capuchin Monkeys are omnivores, eating not only fruits, nuts, flowers, seeds and buds, but also insects, spiders, bird eggs and small vertebrates. They can also eat small mammals. They need a varied and healthy diet. 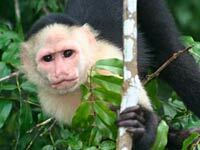 During the season of fruit scarcity, the Capuchin Monkey tends to feed on a greater proportion of insects. 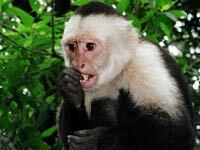 Capuchin Monkeys living near water will also eat crabs and shellfish by cracking their shells with stones. When the young are learning to feed independently, large trees are out of their reach. They wait to be carried into tall trees to grasp some fruit by experienced adults. The group of Capuchin Monkeys is likely to restrict their horizontal and vertical movements to adjust to the limited climbing skills of the young. 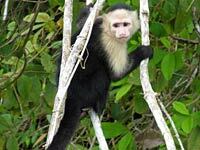 What are the natural enemies of the Capuchin Monkey ? Potential predators include jaguars, cougars, jaguarundis, coyotes, tayras, snakes, crocodiles, and raptors.The main predator of the Tufted Capuchin is the Harpy Eagle, which has been seen bringing several capuchins back to its nest. Capuchin Monkeys have the largest brains of all the New World monkeys. 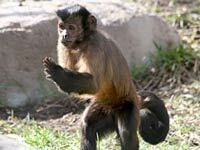 Due to this fact and also due to the versatility of these monkeys, Capuchin Monkeys are used to help paralyzed people. As monkeys have hands similar to human hands, they are able to perform some meaningful and useful actions, like serving food, opening and closing the door, turning on and off lights, retrieving objects needed, brushing hair and etc. Raised with love and attention, Capuchin Monkeys make wonderful companions for disabled people. What is the daily routine of the Capuchin Monkey? With the exception of a midday nap, they spend their entire day searching for food. At night they sleep in the trees, wedged between branches. They are undemanding regarding their habitat and can thus be found in many differing areas. How do Capuchin Monkey's communicate? 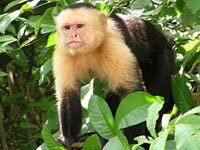 Capuchin Monkeys are very vocal animals that scream, whistle and bark. In this way, they call each other in order to maintain contact and may express their dislike if someone or something disturbs them. During the mosquito season, Capuchin Monkeys crush up millipedes and rub the remains on their backs. This acts as a natural insect repellent. The Capuchin Monkey's hand is similar to the human hand. The thumbs and big toes of the Capuchin Monkey are opposable to the other fingers and toes. Download free Capuchin Monkey wallpapers, click on the image to open the large version. Print free Capuchin Monkey coloring pages, click on the image to open the large version.